Creating defensible space around your home and outbuildings is enhanced by the installation and maintenance of fire-resistant landscaping. A well-maintained yard does not necessarily mean that your landscaping is resistant to fire. Fire-resistant landscapes use fire resistant plants that are strategically planted to reduce the risk of fire spreading from surrounding areas to your home. All plants will burn given the right conditions, but you can mitigate potential damages to your home from plants catching fire by choosing to install plants and trees with low sap content, irrigating sufficiently, removing dead or dying branches regularly, incorporating stone walls and pathways, and making sure there is horizontal and vertical separation between plants. Contact your local drought-tolerant plant nursery for suggestions on fire-resistant plant selection. Download more information about choosing fire-resistant plants for Santa Cruz area landscapes. Tiny burning embers can blow ahead of a wildfire if wind conditions are right, igniting spot fires a mile or more away from the main fire. Therefore, it is important to create defensible space AND to harden your structures against ember-caused ignition. House upkeep, fire-resistant landscaping, building materials, and certain building design features can all play a role in your home’s susceptibility to ember-caused ignition. Download in-depth recommendations on best practices for avoiding structure ignition. Keep gutters, roofs, and decks clear of needles, leaves, and other debris. Clear under your deck if the space underneath has any debris (man-made or natural). Place woodpiles and propane tanks away from buildings. Do not store tools, equipment, or junk piles adjacent to house. Ensure that if fences were to catch fire, they would not guide flames to your house. At present in California, land managers are dedicating more time to controlling non-native invasive plant populations than ever before. One of the reasons for this increased management of invasives is that non-native plants oftentimes change fuel properties in native ecosystems, increasing fire frequency, intensity, and duration. Although most California ecosystems are adapted to withstand fire, and oftentimes benefit from it, the open, burnt landscape is ideal habitat for quick-growing invasives to establish before natives regenerate. In an age where humans and their equipment can travel hundreds of miles in a day, the rate at which invasive plants and animals are spreading is much faster than in historic times. It is important to keep invasive species under control on your property to avoid the risks of changed fire regimes. It is equally important to monitor lands while they regenerate after fire to avoid the establishment of unwanted non-natives. The best way to avoid the risks associated with non-native plant species is early detection and removal. For a state inventory of invasive plants of concern click here. In Santa Cruz County, there is a regional organization formed by public agencies, private landowners, the agricultural industry, and environmental organizations that are concerned with invasive plant species called The Santa Cruz County Weed Management Area. Their list of the top eight invasive species of concern includes: yellow star thistle, jubata grass, pampas grass, French broom, Scotch broom, cape ivy, gorse, and fennel. For helpful information about the status of invasive plants in California, click here. Download an in-depth handbook on fire management and invasive plants. Santa Cruz County residents may be allowed to conduct “backyard burns” during the winter in order to reduce fire danger during dryer months. Burn days are generally December 1 through April 30, however these dates may vary from year to year based on determined fire risk. It is imperative that you follow all local laws before, during, and after brush burning. 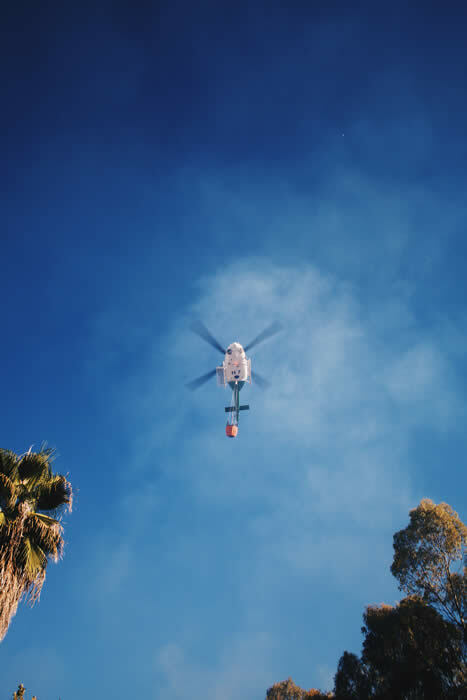 You must obtain a burn permit from either your local fire station or from the Monterey Bay Air Resources District (MBARD). You can find out if your local fire station issues burn permits from this list. Contact your station directly if they issue burn permits, otherwise follow these detailed directions from MBARD on how to acquire a burn permit and then notify your local fire station that you will be conducting a permitted burn. Always obtain a burn permit from your local fire station or from MBARD before burning. Note: not everyone will qualify for a permit as there are restrictions based on location, lot size, and other criteria. Use the MBARD website to figure out which burn zone you are in. Call 1-800-CAL-BURN after 4pm the day before you plan to burn to determine if it is permissible to burn the next day in your zone. Download pile-burning set up and guidelines approved for Santa Cruz County. Additionally, follow all instructions on the Compliance and Enforcement page on the MBARD website regardless of where you obtain your permit from. Notify your local fire station before you start burning to let them know you are going to burn. REMEMBER: only burn on burn days, start after 8:00 AM and extinguish by 4:00 PM, only burn dry material, burning of piled leaves and needles is prohibited, ensure that brush piles are the correct size (no larger than 4’x4’x4’), take proper precautions to ensure fire does not spread, never burn trash (it’s illegal! ), and supervise your burn for the ENTIRE time it is burning. You could be charged for the costs of putting out an escaped burn if you do not burn responsibly and burning on “no-burn” days or without a permit may result in fines or penalties. Thank you for taking the proper steps in keeping our county safe.